We offer handpicked Villas for rent in Croatia, with prices starting from 21 € per night per person. With the help of Villsy.com you can book your private villa with pool in Croatia. Contact us via phone or form if you need more information. Experience modern luxury living and beautiful sea views of this louxurios modern house. Outdoor swimming pool of 50 sqm, a whirlpool, covered terrace with sitting set and barbecue, well-kept lawn and two parking places. Well maintained lawn, 38 sqm large private swimming pool, covered terrace with sitting set, outdoor kitchen. Outdoor pool of 32 sqm with sun loungers, outdoor shower, a spacious covered terrace with garden furniture and a barbeque. Private pool of 24 sqm with sun loungers, covered terrace with dining table and barbeque. Covered terrace with outdoor kitchen, fireplace barbecue with sitting area, swimming pool of 34 sqm with waterfall, parking for two cars. Beautiful panoramic view on the countryside and the sea, all thanks to the elevated position of the house and the garden. Private swimming pool of 24 sqm with sun loungers and parasols, pavilion with sitting furniture, barbecue and parking space for 4 cars. Lovely garden, summer kitchen with barbecue and dining table for 8 persons, 28 sqm large swimming pool, separate toilet and a private parking for 3 cars. It has its own yard of 400 sqm where the guests have on their disposal a covered terrace with barbecue and sitting set, swimming pool of 32 sqm, parking for two vehicles. Croatia lies in the transition zone between Central and Southeastern Europe. 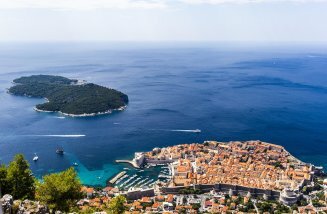 More than 19 million tourists visit Adrialand Croatia every year and about one fifth of them come from Germany. The most popular destinations are Istria, Kvarner and Dalmatia. In Kvarner there are many beautiful places with beautiful beaches, including Rijeka, Opatija, Crikvenica, Mali Losinj and Lovran. In Dalmatia the places Zadar, Split, Sibenik and Hvar are worth seeing. Rovinj, Porec and Labac are popular places in Istria. Croatia has a lot to offer: Historical sights, picturesque landscapes and beautiful beaches enchant the tourists again and again. Cultural highlights include the Amphitheater in Pula, the Diocletian's Palace in Split and the Euphrasian Basilica in Poreč, which has been recognized by UNESCO as a World Heritage Site. In addition to the beaches, Croatia has many different natural beauties to offer: a hike through the Plitvice Lakes National Park is definitely worthwhile. Also the culinary aspect should not be ignored. In the Konobas you will find the many traditional Croatian dishes. 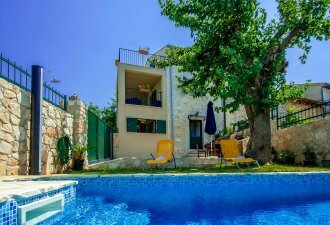 You can enjoy a comfortable stay in Croatia as villsy.com offers you fantastic holiday villas with pool. In our wide offer you can find for yourself the perfect villa with pool in Croatia. All our holiday villas with pool were visited by us and selected with the utmost care for you. Rent a villa with pool in Croatia and enjoy your holiday to the full! There are several ways to Croatia - you can reach the Balkan Peninsula by car, plane and even by ferry! For those who want to have it as fast as possible, the journey by plane is worthwhile. One of the biggest airports in Croatia is Split, followed by Zadar, Rijeka, Dubrovnik and Pula. In particular, Great Britain and Germany have good connections to Croatia. From Munich, for example, it takes about 1.5 hours to fly to Pula. When you arrive in Croatia, you can rent a car next to a villa to explore the area. Many tourists also travel by car to the popular holiday regions of Istria, Kvarner and Dalmatia. Istria is particularly easy to reach by car. For example, you can reach Umag from Munich by car in 5 hours. The route goes through Slovenia and Austria. Pay attention here to the vignette! To reach the west coast of Istria you can also choose a route via Italy. Here one should note that a motorway toll is present. From Italy, Croatia can also be reached by ferry. Before your trip you should definitely stop by our holiday villas and book the suitable villa with pool! Croatia has many natural beauties and cultural attractions to offer. The national parks in Croatia are a true dream. For example, the National Park Krka in Dalmatia, which originated from the river of the same name, forms a wonderful natural spectacle of several lakes. With its emerald green waters, huge waterfalls and lush flora and fauna, the National Park has made it to UNESCO's list. If you visit Croatia in the season from April to October, it is worth to take a look at the cave Baredine close to Porec. The well-developed cave can be explored with a guide on a 300 m long and 60 m deep path. In the beautiful old towns one can follow the history of Croatia. In particular, Dubrovnik is referred to as "the pearl of the Adriatic" in this context. It is considered one of the most beautiful cities in the world and is characterized by its mighty city walls, museums, churches and idyllic town squares. Here you can rent a nice villa with pool nearby! The city of Rovinj, which is located in Istria, is a real tourist magnet. The romantic old town offers with its idyllic lanes and buildings directly on the sea a unique flair. Historical fact about Rovinj: The city was once an island and was connected by landfills with the mainland. There are also traditional festivals in Croatia, such as the fun Ičići Days in Kvarner, which take place in September. You should not miss a first class villa with pool to rent! In Croatia you can do a lot. In particular, Istria has many sports activities for outdoor enthusiasts. In Labin and Rabac you can explore the beautiful hilly landscape. You walk through numerous forests and can observe beautiful beaches along the coast. For cyclists there are many exciting challenges in Istria. You can start a tour to Pula here. Starting with the nature reserve Kamenjak it goes over the cities Medulin, Marčana and Rakalj. As a cyclist you can see sights that can not be reached by car. The coast and the island of the Kvarner bay are ideal for snorkeling. Crystal clear water and numerous gravel and rocky coves make snorkeling a special experience. If you want to visit Dalmatia, you should definitely visit Dubrovnik. Here you can canoeing. During the canoe trip you will cross abandoned caves and marvel at majestic cliffs. With the appropriate guide you will also learn a lot about the history of the Adriatic Sea. So that you can recover well from your activities, it is simply a must to rent a beautiful villa with pool in Croatia! In the villa you can fully relax. 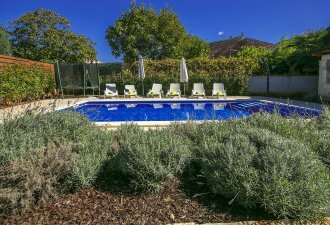 Book your villa with pool at Villsy! We have the right holiday villas for your holiday in Croatia! On our website you will find hand-picked villas, which were visited by our team and appraised! With us you can be sure that every villa in Istria offered by us offers you the highest comfort. If you have questions, you can reach us 24 hours a day, seven days a week. We are always there for you with complications and ambiguities! With us you can relax and rent your villa with pool in Croatia. The booking of your villa in Croatia can be conveniently made online. Villsy offers you prime rental vacation rentals so you can enjoy your vacation!